On 14 September 2015 at 9:50 GMT, the two detectors of the newly upgraded Laser Interferometer Gravitational Wave Observatory (LIGO) detected a signal. It was unambiguously a gravitational wave signal because it matched the predictions from Einstein’s general theory of relativity almost precisely. It is as well a triumph of virtuosity in observation and measurement. The detection of a gravity wave is a simply wondrous an act of human hands and mind. It is a joy to witness, at least for me. More after I get the paying work done…. 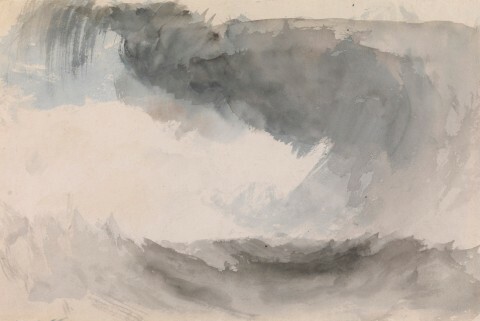 Image: J. W. M. Turner Storm at Sea 1851 or before. This entry was posted on February 11, 2016 at 1:05 pm and is filed under astronomy, physics, Science, Uncategorized. You can subscribe via RSS 2.0 feed to this post's comments. Hi! I had just started reading The Hunt for Vulcan the day before this announcement. When you write more about the LIGO result, perhaps you could address the likelihood (i.e., your best educated guess!) that this observation is sound and that gravity waves really were detected. I’m thinking, of course, of the BICEP2 observations mentioned in your book, as well as other turned-out-to-be-erroneous-or-misinterpreted observations also described in the book. Thank you! Many thanks for your kind words about The Hunt for Vulcan! Finally, a couple of other bits of support: the neat match between GR simulations of black hole collission/mergers and the actual signal detected is hardly a confirmation, but it does map onto the notion that the signal is real is the most economical account of what happened at LIGO. Second, there are credible reports of more detections at weaker signal strength, and the best confirmation will be more data that’s in agreement with the initial event.